I love glazed donuts for breakfast! I know they are not healthy, but sometimes you have to give in to temptation. 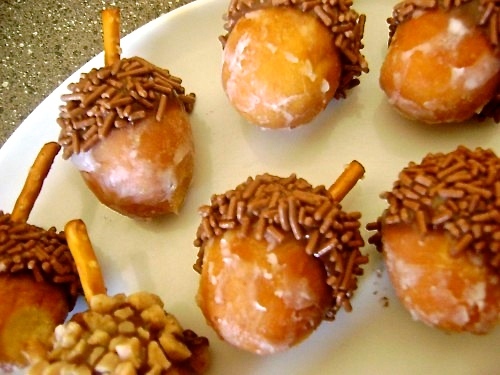 So, when I saw these acorns made from donut holes, I fell in love with the idea. Because this recipe does not call for cooking or baking, I thought this would be a great food project to do with children. Just think of how much fun they will have dipping their donut holes into Nutella and covering them with sprinkles or crushed peanuts. You could also bring these to an upcoming, office potluck. I am sure they would disappear in no time! If you do use crushed peanuts, make sure to put out a sign just in case someone has an allergy. For a full photo tutorial visit Gracious Rain.